Today we are between May 1st and May 4th. Both days have major significance. Yesterday +Me2 reminded me it was International Workers Day in much of the world and right around the corner is May the Fourth. This is practically a Star Wars holiday in the geek world. The closeness of these two “holidays” is not a coincidence. I don’t believe in coincidences. Earlier when Me2 asked in a post if the seasons effected how and what we photograph, it got me thinking. Why do we choose the figures we choose to shoot? Why is the most photographed figure in the toy community the ubiquitous Stormtrooper? You’ve seen him, I know you have, he’s everywhere! Personally I haven’t been attracted to the Stormtrooper figure but a lot of people are. He has been photographed in every conceivable situation in a variety of sizes and styles. He is portrayed as the bumbling fool, the guy who can’t shoot straight, the deep thinker, the adventure seeker and the doting parent. A far cry from the elite soldiers who used brutal tactics to keep the Empire in line. 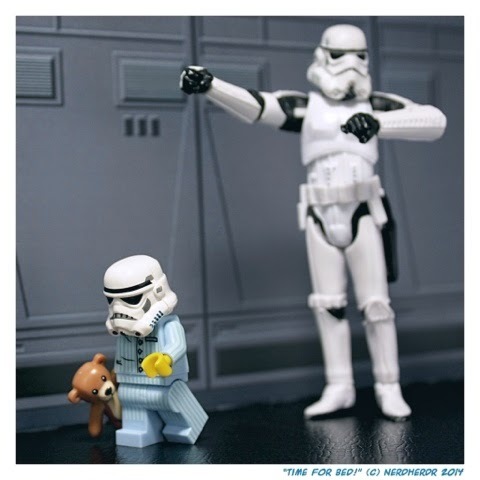 This photograph by +Cellblog 1138 is a great example of the humanization of the Stormtrooper into the stern parent sending his “child” off to bed. The Stormtrooper has morphed from a dreaded enforcer of the Emperor’s will to a representation of the fallible yet lovable every man. Maybe I’m stretching a point (it wouldn’t be the first time). I think the figures we are attracted to photograph actually mean something. I think we choose figures / character we can relate to. I think we then take it the next step and imbue them with our own emotions and personalities. Do you have a favorite mini figure you like to shoot? Have you thought about what that figure means to you? Would you be willing to tell us who your favorite is and why? Feel free to tell me I’ve gone over the deep end or tell me “Duh!”, whichever is most appropriate. And as always, May the Fourth be with you! For the record I have replaced the Pandas for Storm Troopers in my little plastic world; they represent my Everyman. My favorite mini figures are the Chima Eagles. I like that they come in both black and white and therefore can represent good and evil. I don’t always shoot lego, but when I do, I prefer a mohawk sporting, tomahawk wielding mini-brave. Not sure why I like him the most, but he looks good outdoors, that’s for damn sure. Perhaps it’s my eternal love of “Last of the Mohicans” and all this antiquated.